Our primitive boxes and drawers make unique and one-of-a-kind Catch-Alls. Availability of colors may be limited, explained by the descriptions. Our wooden drawer boxes are approximately 12 inches in length, 3 1/2 inches high and 5 inches wide. A knob is fastened to one end. Available in Forest Green lettering with Black shadowing on Antiqued White background; Burgundy lettering with Black shadowing on Antiqued White background; Antiqued White lettering with Black shadowing on a Forest Green background; Antiqued White lettering with Black shadowing on Burgundy background. These boxes look wonderful storing any odds and ends you might need to store in a box! 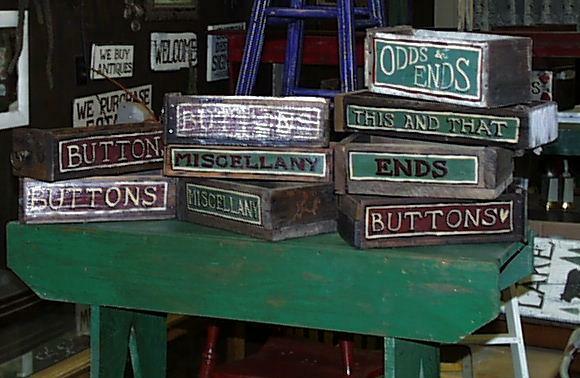 Your choice of one word painted on both sides of the box: Dominoes, Checkers, Jacks, Miscellany, This N' That, Odds N' Ends (Well, that's ALMOST one word! ), and, of course, Buttons. Store anything in these prim cuties and let your clutter look organized. Aged to look as though it has had loving usage in the last few decades, this is a great bargain for the price. 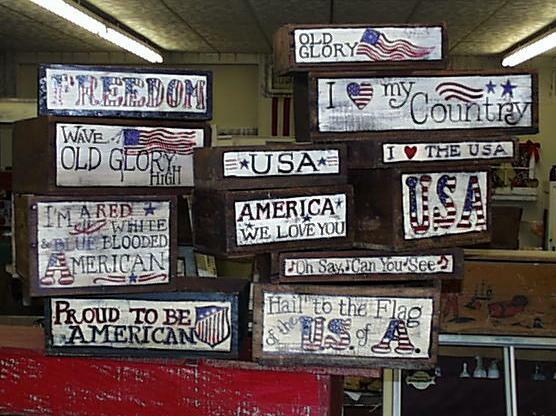 These are the loveliest primitive patriotic boxes approx 14 inches long, 8 inches wide, and about 6 inches tall. The picture shows sizes different from that which we have done in the past, but illustrates designs which you may request. All are handpainted, so each is unique. Simply email us your choice, and we usually can have it finished ready to ship within 10 days or so. 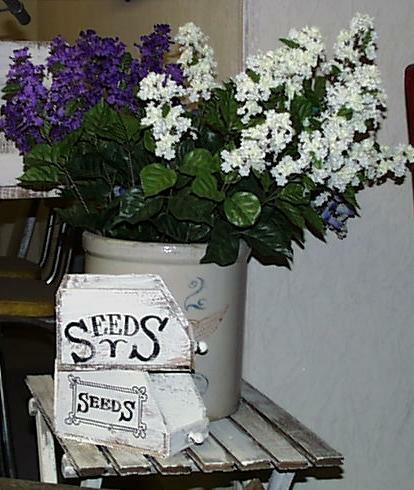 These are the cutest little boxes to keep garden seeds. The flourishes and lettering on the sides says it all. Available in antique white with black lettering only. Dimensions are 6 inches long, 4 inches wide and 3 1/2 inches deep. A little knob on the front adds the finishing touch.